Westbound Interstate 526 (Mark Clark Expressway) crosses the Cooper River over the Don N. Holt Bridge. An integral connection through into North Charleston, the steel through truss bridge with an 800 foot long main span opened on March 10, 1992 and cost $20 million to build.1 Photo taken 05/30/07. Connecting with U.S. 17 on both sides, Interstate 526 constitutes a belt route to the north of Charleston through the city of North Charleston. The freeway crosses over the Cooper River on the Don N. Holt Bridge, a three span continuous modified Warren truss (structural steel).1 A second high level span, the James B. Edwards Bridge, takes I-526 across the Wando River between Daniel Island and Mount Pleasant. The eastern end of Interstate 526 connects with both U.S. 17 at Hungry Neck Road and Business Spur I-526 (Coleman Boulevard) west toward Sullivan’s Island. The western terminus connects with U.S. 17 at S.C. 7 (Sam Rittenberg Boulevard) in west Charleston. Roadway stubs and grading there were built for the eventual southeasterly extension of the freeway toward Folly Beach and onto James Island. The James Island Expressway, S.C. 30 between S.C. 171 (Folly Road) and Downtown Charleston, represents the future southern extent of I-526. Debated and delayed for two decades, the South Carolina Department of Transportation (SCDOT) moved forward on a contract to complete the remaining portion of I-526 on December 5, 2013. This measure advanced after the Charleston County Council voted to proceed with the contract in December 2013. The initial contract was estimated at $558-million.3 Despite the optimism for a possible 2020 completion of I-526,4 funding was not finalized and work on I-526 has remained on hold. The western extension of I-526, from North Charleston to S.C. 7 was approved by AASHTO on October 6, 1989. The route was signed shortly thereafter, starting with the section that was previously signed as S.C. 31 from U.S. 17 northeast to I-26. 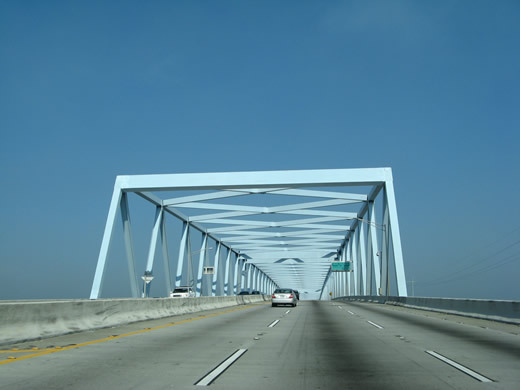 Dedicated on June 20, 1992,2 Interstate 526 was extended southeast to rejoin U.S. 17 north of Charleston with the completion of the Don N. Holt Bridge over the Cooper River. The freeway directly transitions onto Business Spur I-526 in Mt. Pleasant, which was also signed in 1992. Interstate 526 angles southward toward the wye interchange (Exit 29) with the connector to U.S. 17 at Hungryneck Boulevard. Photo taken 11/12/06. Exit 29 separates from I-526 eastbound. Widening along U.S. 17 finished in January 2013 included the addition of a single point urban interchange (SPUI) with the freeway connection from Exit 29 at Hungryneck Boulevard. Photo taken 11/12/06. The remainder of I-526 leads south to a parclo interchange (Exit 30) with U.S. 17 south and Business Spur I-526 (Chuck Dawley Boulevard). Photo taken 11/12/06. Former button copy overheads at the exchange joining I-526 with U.S. 17 at Mount Pleasant. Photo taken by Chris Patriarca (06/09/03). Westbound Business Spur I-526 transitions onto Interstate 526 just north of Bowman Road. With the interchange built at U.S. 17 and Bowman Road in 2012, Exit 30 was modified to connect with U.S. 17 northbound only. and on 11/12/06. Exit numbers along I-526 between Mount Pleasant and Daniel Island (Exit 24) were unnumbered originally. Photo taken by Chris Patriarca (06/09/03). Six lane expansion of U.S. 17 (Johnnie Dodds Boulevard) through Mount Pleasant added a diamond interchange with Bowman Road just to the west of I-526 and Business Spur I-526. The ramp for Chuck Dawley Boulevard south was relocated to depart from the entrance ramp at Bowman Road. Photo taken by Chris Patriarca (06/12/03). U.S. 17 north at the former off-ramp for Business Spur I-526 eastbound. Chuck Dawley Boulevard loops southwest to S.C. 703 (Coleman Boulevard) through Mount Pleasant. Photo taken by Chris Patriarca (06/12/03). A loop ramp follows from U.S. 17 (Johnnie Dodds Boulevard) north for I-526 west to Daniel Island and North Charleston. Photo taken by Chris Patriarca (06/12/03). Replaced button copy gore point sign on U.S. 17 north at I-526 west. Photo taken by Chris Patriarca (06/12/03). Prior to completion of the SPUI here in 2013, the connector linking U.S. 17 south with I-526 west at Hungry Neck Boulevard originated at an at-grade intersection. Photo taken by Chris Patriarca (06/09/03). Grade separations at both Hungryneck and Bowman Roads along U.S. 17 were built during a three mile widening project. Photo taken by Chris Patriarca (06/09/03). Original guide signs for U.S. 17 south at Business Spur I-526 (Chuck Dawley Boulevard). Photo taken by Chris Patriarca (06/09/03). A pair of end freeway signs precede the ramps for S.C. 7 (Sam Rittenberg Road) and U.S. 17 (Savannah Highway) on I-526 west. Photo taken 05/30/07. All traffic on I-526 shifts onto the ramp for S.C. 7 and U.S. 17. A roadway stub and grading allude to the planned extension south to James Island. Photo taken 05/30/07. Succeeding traffic lights connect the western end of I-526 with S.C. 7 (Sam Rittenberg Boulevard) and U.S. 17 (Savannah Highway). S.C. 7 provides a cut off for U.S. 17 south toward Savannah while the arterial route northbound leads to adjacent Citadel Mall and the city of North Charleston. Photo taken 05/30/07. An overpass carries traffic from U.S. 17 northbound to I-526 east above the signalized intersection connecting I-526 west with Savannah Highway. U.S. 17 heads 3.5 miles east to S.C. 171 for Folly Beach and 4.6 miles to Downtown Charleston. Photo taken 05/30/07. An original button copy guide sign for the west end of Interstate 526. Photo taken by Chris Patriarca (06/08/03). U.S. 17 eastbound approaches the split with South Carolina 7 (Sam Rittenberg Boulevard) north and the eastbound beginning of Interstate 526. Photo taken by Chris Patriarca (06/11/03). A loop ramp follows the signalized intersection with S.C. 7 (Sam Rittenberg Boulevard) for I-526 eastbound. I-526 and S.C. 7 both lead northeast across the Ashley River to North Charleston. Photo taken by Chris Patriarca (06/08/03). S.C. 7 angles 5.92 miles northeast from U.S. 17 (Savannah Highway) to U.S. 52/78 (Rivers Avenue). Ramps connect the state highway with I-526 near adjacent Citadel Mall. Photo taken by Chris Patriarca (06/08/03). The flyover leading Interstate 526 north across both U.S. 17 (Savannah Highway) and S.C. 7 (Sam Rittenberg Boulevard) was completed in 1999. Photo taken 05/30/07. An array of businesses line both sides of U.S. 17 (Savannah Highway) within the vicinity of the partial interchange with Interstate 526 (Mark Clark Expressway). Photo taken 11/12/06. I-526 heads seven miles north to the exchange with Interstate 26 in North Charleston. The four lane section of U.S. 17 extends west another 25 miles to Jacksonboro Photo taken 11/12/06. Overhead signs were added at the on-ramps for I-526 in both directions of U.S. 17 (Savannah Highway) between 2003 and 2006. Photo taken 11/12/06. Interstate 526 will overtake S.C. 30 along the James Island Expressway eventually. The freeway spans the Ashley River into Downtown Charleston beyond the trumpet interchange (Exit 1) with S.C. 61 (Herbert U. Fielding Connector). Photo taken by Chris Patriarca (06/12/03). Crossing the Ashley River, S.C. 30 approaches a six-ramp parclo interchange with Lockwood Drive. Photo taken by Chris Patriarca (06/12/03). The James Island Expressway concludes at this partition for ramps to Calhoun Street east into Downtown, Lockwood Drive south to the historic Battery district, and the continution of S.C. 30 north. Photo taken by Chris Patriarca (06/12/03). Calhoun Street stems east from the James Island Expressway directly while S.C. 30 turns north along Lockwood Drive to connect with U.S. 17 at Spring and Cannon Streets. Photo taken by Chris Patriarca (06/08/03). Westbound Calhoun Street transitions onto the James Island Expressway (S.C. 30) at the exchange with Lockwood Drive. Photo taken by Chris Patriarca (06/12/03). Lockwood Drive straddles the west shore of the Ashley River from the historic Battery to become a part of S.C. 30 at the James Island Expressway outside Downtown. Photo taken by Chris Patriarca (06/12/03). A loop ramp departs from Lockwood Drive for S.C. 30 west across the Ashley River to James Island and S.C. 171 to Folly Beach. Photo taken by Chris Patriarca (06/12/03). S.C. 30 follows Lockwood Drive a quarter mile south from U.S. 17 (Spring / Cannon Streets) to the James Island Expressway (future I-526) across the Ashley River. Photo taken by Chris Patriarca (06/12/03). Case Studies: Cooper River Bridge Fact Sheet. http://www.cee.cornell.edu/academic/case_studies/cooper/index.cfm Cornell University. “Spartanburg officials joyous over decision.” Herald-Journal (Spartanburg, SC), June 21, 1992. “SCDOT Commission approves revised I-526 contract.” The Post and Courier (Charleston, SC), December 5, 2013. “SCDOT Commission approves I-526 completion project.” WCBD-TV2 (Charleston, SC), December 5, 2013. “STATE’S PRAISES OFTEN HIT THE ROAD S.C. HAS TRADITION OF NAMING ROADS.” The State (Columbia, SC), February 12, 1996.